One of the things I love about mountain biking is that it puts me in touch with the passing seasons. The thing about riding outside through the year is that there’s no way of avoiding noticing the conditions, the weather, the climate, the nature of the ground beneath your wheels (or feet if it’s really bad). I may bemoan it when I come home cold & wet (or refuse to go out at all) but I love the feeling of connection it gives me. The weather in Britain is nothing if not unpredictable. 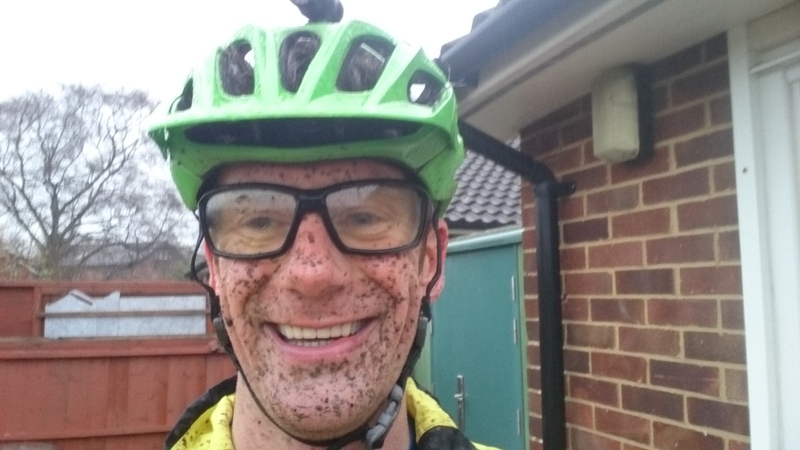 There’s a reason why I take a waterproof out on all rides of any length. But the seasons? There’s a genuine pattern to them. The winter is colder and wetter than the summer. Autumn has the air of the winter with the ground of summer and spring is boggy under the wheels but warm on the arms. These changes serve to mark the passing of time. Those changes are mirrored by the riding. Summer is all about dry, fast trails in sunlight. Autumn has that dryness in the ground but the wind is colder and there’s a better chance of being rained on. 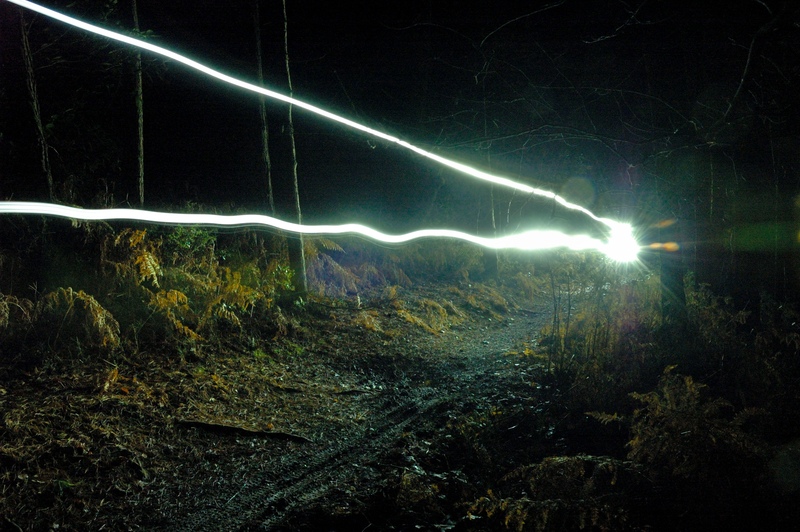 Those dry, dusty trails of summer can turn into deeply mudded horror-shows with notional traction ridden in the dark. In spring, there’s the promise of warmth and greenery sprouting up everywhere, but there’s also a good chance of coming home spattered in mud. These changes in turn are mirrored by changes to how I ride and what I ride. There’s that moment in spring when my arms come out for the first time in months, the moment when the mudguards come off, the first evening ride without lights. 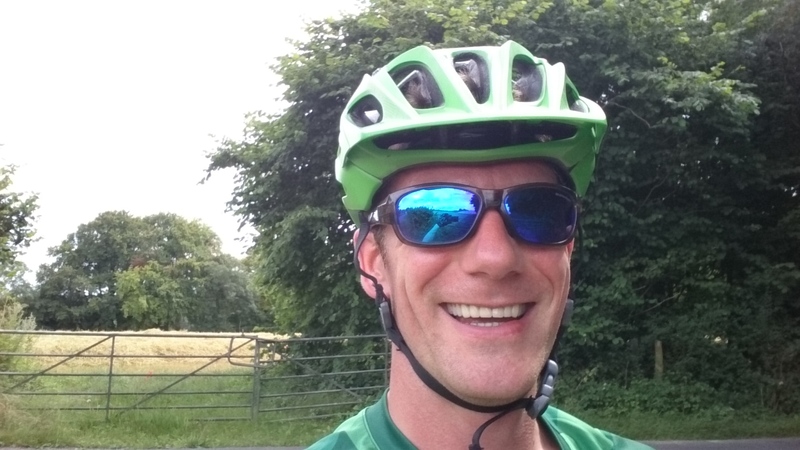 In summer there’s the first evening ride in dark glasses, the urge to ditch the backpack to let heat out, suncream! In the autumn I have that moment when I try to remember where I put my lights for the summer, pulling out the windproof gloves for the first time, waterproof shorts and boots. In the depths of winter I’m tempted by the ease of cleaning that comes with the hard tail, I remember where my thick gloves and skullcap are, remember why I own thermal jerseys. A road is a road is a road. Sometimes it’s damp, icy or even underwater. But mostly it’s the same. Trails evolve and change through the seasons. It’s a cliché that you never ride the same trail twice, but there’s some truth in it. In summer a trail might be dry and dusty, ripe for ripping along at speed. In winter that same trail is as slippery as a speedway track ripe for sliding along sideways. Conversely a trail that’s an overgrown exercise in verdant spelunking in the summer is wide open when the vegetation dies back. Years of experience has told me what to expect from my regular trails at any given time of year. Some trails are deeply seasonal: too overgrown in the summer or too slippery in the winter. Some are very resilient, holding onto grip when everything else is slippery. My inner trail map is four-dimensional: time is crucial. That’s not to say that the unexpected never happens. I remember riding during the floods a couple of years ago. It’s a sunken lane I’ve ridden hundreds of times and never really thought about too much. On this occasion, it was two feet deep in water for an unavoidable few hundred yards. Every pedal stroke dipping my feet in the water. Then I got a puncture. Suffice it to say that I didn’t go back until spring! This change in the conditions, the riding style required and the experience of riding is what keeps the local trails fresh and exciting for me. It also keeps me connected to the world around me. It keeps me connected to the slow cycle of the changing seasons. It keeps me reminded of my place in the scheme of things. So why not come out and join me as we experience what the world is like this week? It’ll be different next week. And the week after too. After my tour of the singletrack highlights of the city of Edinburgh on Saturday I was in Glasgow on Monday. This time I was hooking up with an old colleague, Andy (just to be confusing), for a trip to Glentress. This, most iconic of trail centres, would be a very different experience. Where Saturday was about finding things that were unexpected, this was all about having a blast on purpose-built mountain bike trails. I was really looking forward to it. Last time I was at the Peebles trail centre, was maybe six or seven years ago on a 100mm travel hardtail with 1.8” tyres. I recall the red route being a little hairy in places, mostly due to our introduction to braking holes in the trail, but otherwise a lot of fun. On an earlier visit I’d underestimated a tabletop on the Spooky Wood descent and ended up with my scaphoid in plaster. I was curious what the trails would feel like all these years later with more bike and more experience under me. I was keen not to have a repeat of the Spooky Wood incident. Andy is very much a product of the Seven Stanes. Very happy with rocky, technical trails and comfortable with the bike in the air. This was very much his home turf and he was keen to show off the best bits. I am a fully qualified mountain bike leader. I am a pretty competent mountain biker in a variety of terrain. That does not mean there are no areas where I feel my skills might benefit from “development”. It boils down to being in the air and steep rocks, neither of which are easy to get in Hampshire. So part of the point was to get plenty of that in over the course of the afternoon to refresh and hone my skills. 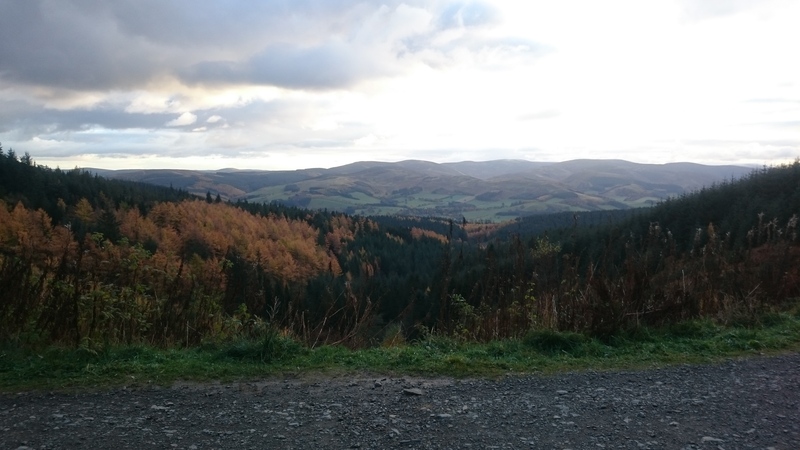 Glentress has been, and may still be, one of the most visited mountain bike venues in the world. One of the joys of visiting on a Monday in the middle of November is that the place was really, really quiet (apart from the lads changing, wrapped in leopard print towels, in the car park). We headed for the skills area for a bit of a play to get our eye in. We checked out some rock rolls and drops. All of which are bigger than anything I’ve encountered in Hampshire. It’s hard to find features where air time is compulsory. Drop in we did. First time: wayward, second time: better, third time: nailed and confident. I was getting my eye in and believing in my skills. Which is when Andy suggested we move on the freeride area. Some tabletops, about 3-4 feet across the top, a few berms and a step-up. All bigger than anything at my local trail centre. First time: intimidating but largely managed, second time: better and quicker, third time: confident and at pace. I was getting there. These were skills I have but don’t get much chance to work on at home. So Andy suggested we move on to the bigger jumps. Hell, why not. These are probably 4-5 feet across at the start and bigger at the bottom. So we dropped in. Hit the first one, whoop. Hit the second, whoop. Hit the third, oh god, it’s a hip jump and the landing’s at an angle to the take off. Land it and slide the back wheel round to set up for the next one. Launch that and hope the landing’s in the right place. Catch berm and two more tables to finish. On the final one it seemed to take an eternity for the bike to come down, even then it was only the front wheel. Don’t panic, weight back and wait for the back wheel to land. Which it did, eventually. And done. I’d got away with it. Just. But definitely outside of my comfort zone. Push back up and drop in again. This time the lines were better, the speed was better and I spent less time riding along on my front wheel. Again. Better again. And crucially, more confident. Again, this time with the confidence to attack it. It’s amazing how much succeeding at something at something can boost your confidence. Anyway. Why were we here? Soon enough we needed to get on our way: there was only so much daylight to play with. And we had an appointment with Spooky Wood and the drop to the valley floor. All that stood between us and that was a big climb. Oh well, best get on with it. After a considerable amount of twiddling, gurning, grinding and a brief pause for a sandwich while a robin landed on our bikes we arrived at the top of the hill. I had brief flashbacks to the last time I’d stood here with a hire bike, before coming to grief. Concentrate, trust your skills and believe that your bike will do the job. It was brilliant. A helter-skelter all the way to the bottom. Tabletops were despatched, compressions were pumped through, puddles were manualled past and even the surprise rock drop was launched. It was great. I was looking ahead, seeing what was coming and picking my line. I was loving it, and catching Andy in places. Next section: more of the same, compressions, berms, small tables and the occasional steep bit. All the application of skills in an unfamiliar setting. I may not have been familiar with the trail but I was more than equal to the challenge. The tight section through the trees was much more like home with its slippery roots and leaf mulch. The bottom was just laugh out loud. I grinned the whole way down. Even the bits where the tree cover meant it was almost dark. In short I had a great day out. The free coffee at the end was a real bonus. I can’t recommend Glentress highly enough. Thank you to all the trail builders there. I can see how much of a pasting the trails get and how much hard work goes into keeping them riding sweetly. On Monday I went out to ride and have fun. I also chose to deliberately put myself in a situation where I was outside my comfort zone to begin with. I chose to use the opportunity to refresh and practice my skillset. By doing so, in a managed and progressive way, I had a great ride and was able to boost my confidence on terrain that’s hard to find down here. The use of the first person pronoun is really important. I chose to put myself there. There was no pressure on me, no-one was egging me on, if I decided I really didn’t fancy something I could walk it. When it comes to progressing and improving skills, peer pressure can be a terrible thing causing you to feel compelled to try things you are not ready for. It makes you more likely to make a mistake because you’re tense so it’s not a part of the way I ride, or the way I lead. Placing yourself in a space where you feel confident pushing your boundaries and putting your skills into use is a good thing, coming from within and a desire to improve. I will support you in this whenever I can. When you say “I’m not feeling confident about this” I really do understand how you feel. My desire to get better at riding my bike means I have to step outside my comfort zone in the belief that I have the skills to ride it. I know that feeling of having to attempt something based on belief rather than memory. I know that feeling of taking a deep breath and committing. The setting for this feeling is different for everyone, the obstacle that causes you to pause is different for everyone. When I say that I understand, it’s not glib encouragement, I really do empathise with facing down uncertainty. Cracking singletrack, stunning views and two of the area’s best loved pubs. What more could you ask for on a ride? This is a tour of some of the lovely trails, villages and pubs like the Hampshire Bowman in this part of the world. What’s not to like? This ride shows off some of the quiet green lanes and forgotten paths through Hampshire that are ideal for relaxed riding. 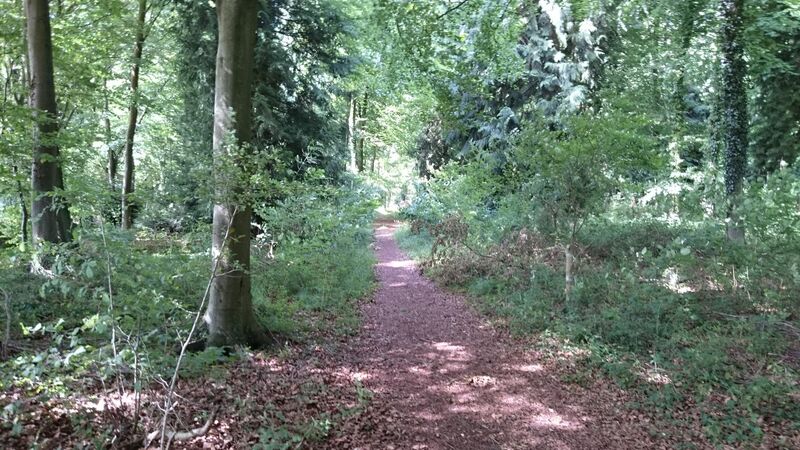 The mix is spiced up with some lovely woodland singletrack which is lovely at this time of the year. To keep the adrenaline going there are a few great descents that will keep you on your toes but are a hoot whatever speed you ride them at. You want views across the downs too? We’ve got them in spades at various points along the way. We’ll be setting off from the Hampshire Bowman pub in Dundridge, heading in the direction of Owslebury before swinging through Upham on the way back. Stops in villages will depend on how the group is feeling when we get there. There will definitely be the opportunity for a pub stop at the Bowman on our return. There’s a fair amount of up and down in this ride, some of it is quite steep but all of it is perfectly rideable if you take your time. So you will need to be able to ride for a few hours. There is nothing too technical so most people with a reasonable level of fitness will be fine. Expect to be riding for 2-3 hours plus a few stops. Whilst the pubs we stop at serve food, it’s a really good idea to bring some sustenance for the ride.